Let Them Come could well be the story of a man who wishes he was alone. However, he is in the company of a) waves and waves of mutated creatures wanting to dismember him, and b) a large machine gun, so it would seem he is unlikely to enjoy any kind of a quiet life. This year’s EGX was the second year running that Tuatara Games’ shooter was on show at Versus Evil’s room, with slightly different game modes running each time. The core game is pretty simple, as you sit on a machine gun nest on the far left of the screen, an extreme letterbox display giving you some warning of when things will begin running at you, and letting you fire at roughly wherever the mouse cursor is. 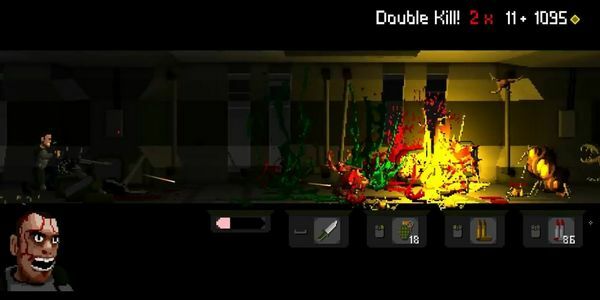 Blowing away the critters swarming you leads to as gory a series of deaths as can probably be managed in pixel art, as well as a small cash reward, which in the previous year’s display was spent between waves on buying upgrades for the gun itself. There are numerous elements to balance (faster firing vs overheating or loss of accuracy, limited specialised ammo vs the unlimited vanilla kind, etc), all in the hope of delaying your own fairly visceral demise as you get eventually overrun. It reminds me of Crack dot Com’s 1996 platform-shooter Abuse, focused on cursor aiming in a grim environment. But the lack of movement in Let Them Come does change the execution of the game dramatically – not only do you need to pick off enemies walking towards you before they get too close, but you need to clear anything scurrying along the ceiling before they get past the approximately 45 degree angle you can aim the gun upwards. From the description alone you’d think that holding the trigger down and clearing creatures only approaching from one direction would be unchallengingly easy, but Let Them Come is a game that emphasises “you will die – a lot”, and in practice this is definitely the case. Tactically, it’s not a matter of just shooting, so much as priorising targets (ceiling critters? Exploding things on the floor? Shooting things being fired at you?) and customising your gun for optimum efficiency. It’s fun, especially in an overkill manner as things burst, explode and otherwise suffer the effects of your firepower (and, notably, the game’s website wants age verification before taking a look, suggesting an 18 rating may be on the cards), although as any nuances in dealing with waves can be still be summarised with “sit on the left, shoot to the right”, it’ll probably be when the game is released that we’ll know if it is fun in short bursts – show floor play lengths, say – or will offer enough to make it stand out for a longer period of time. 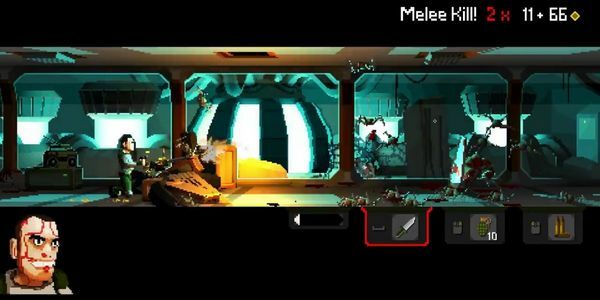 Let Them Come is due for release on PC and mobile devices.